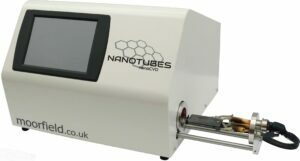 The nanoCVD-8N is optimized for the synthesis of single-walled nanotube (SWNT) networks. The SWNTs produced are high-quality with typical diameters of 0.7–1.2 nm – when using the suggested schemes. The system contains a low-mass heater stage for uniform heating of catalyzed substrates. The stage slides into a small volume, cold-walled reaction chamber.